Swansea striker Wilfried Bony has called for unity as the club attempt to reverse their desperate run of form. The Swans have now lost their last five matches, including four in the Premier League, and only Crystal Palace's early-season travails are keeping them off bottom spot. Saturday's visit to Burnley saw them comfortably beaten 2-0 by Sean Dyche's side with the first goal scored Jack Cork, a man they shipped out in a summer of questionable transfer activity. Pressure is building around manager Paul Clement, who is set for talks with majority shareholder Steve Kaplan, and chairman Huw Jenkins also came in for criticism from the travelling contingent at Turf Moor. 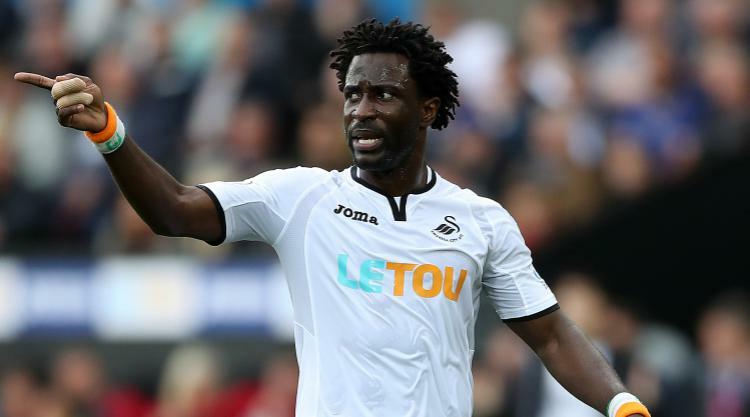 But Bony, who has known good and bad times in his two stints at the club, believes everyone associated with Swansea needs to pull together. "Our position is not good at the moment so we need to stay together, fight and learn from our mistakes from Saturday," he told www.swanseacity.com. "All I can say is that we are very sorry for what happened on Saturday. I promise we will do our best next week. We know at the moment the fans are unhappy, we are too. "We need their support to lift us for the next game. It won't be easy against Bournemouth, but their support is going to be crucial for us in a difficult moment. "We need everybody right now. We are not in a good moment but if everyone stays together then the team can get to where it wants to be." After Cork's headed opener Burnley effectively settled the tie when Ashley Barnes lashed home his first goal since April just before half-time. The striker would probably not have started had Chris Wood been ready to go but the New Zealander was rested by Dyche after a gruelling international week. The All Whites only used Wood from the bench in their two-legged World Cup play-off against Peru due to concerns over a hamstring complaint, but Dyche insisted it was air miles rather than injury which kept his top scorer out. "He'd taken three flights to get back and come straight from the airport to training on Friday, I don't think that's conducive to playing football," he explained. "He was never in my thinking once I found out the logistics. He's fine and he'll train as normal next week."